Kent County Search and Rescue is a FEMA Typed Wilderness Search and Rescue Organization and we require our members to achieve the National Standard for a Professional Wilderness Search and Rescue Technician as describe by the National FEMA SAR Working Group. As part of the FEMA Working Group Standards, we require our members to become a Certified Search and Rescue Technician, Level II. Crewleaders are encouraged to become a certified Search and Rescue Technician Level 1 – Crewleader. Our Roster currently has 20 SARTECH II Certified Personnel, 6 SARTECH Evaluators, and 1 SARTECH I/Crewleader. This represents the largest “Certified” responding roster in the State of Michigan. 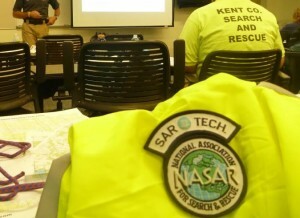 In 2011, KCSAR hosted the first Fundamentals of Search and Rescue (FUNSAR) and the SARTECH II Examination in Michigan. Agencies who expect to respond in the state of Michigan are encouraged to adopt the national standard to comply with FEMA requirements for Wilderness Search and Rescue. Our next FUNSAR Course and SARTECH II Exam is April 4-6, 11-13. Professional Members of Kent County Search and Rescue have priority for the slots, then other Professional Responders and Professional Search and Rescue Agencies. Remaining slots go to members of the public, CERT Team Members, Citizen’s Corp Volunteers and other citizen organizations. Interested individuals can contact the Chuck Hayden, Deputy Director of Training for more information and to register. The FUNSAR course also provides the student with practical exercises in addition to a practice search mission where the students are required to have the proper equipment and stay out in the field during daylight and nighttime operations. The course content includes topics in three major areas: survival and support, search and rescue. This course is based around the rural and wilderness environments but the material is recommended as a basis for all SAR environments. The newest edition of the Fundamentals of Search and Rescue textbook was released in 2005. Previous editions of the textbook will not prepare one to challenge the FUNSAR exam or the SARTECH II certification. The recommended number of hours for the course is (47) forty-seven. The course is usually conducted over two weekends starting on Friday night but can be taught (5) five days straight. Those interested in becoming involved or have just become involved with search and rescue operations. SAR personnel who would like to maintain or refresh their knowledge of search and rescue. Emergency response personnel who belong to organizations who provide resources and assistance during search and rescue missions. Managers of emergency response organizations who want to understand the state of the art skills and knowledge needed by the SAR workers. Community members and groups (scouts, hunters, hikers, etc.) that have an interest in safety and preventative SAR operations. The written exam given at the conclusion of the FUNSAR class is the written SARTECH II exam. Provided the student passes the written SARTECH II exam at the conclusion of the FUNSAR class, AND takes the SARTECH II certification exam within a year, the student is not required to retake the written exam at the time of the SARTECH II certification exam. They only are required to take and pass the six (6) SARTECH II practical stations to earn their SARTECH II certification. Contact the Training Unit for more information.